The Federal Communications Commission, the U.S. agency for the control of telecommunications equipment, has approved a new device this morning, the Finnish giant, Nokia RM-813. 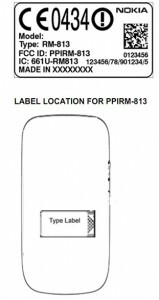 The information we have about this smartphone are very few, but thanks NAME ID, which is labeled 302, and battery information, from a BL-5J 1320 mAh, it is possible that it may be an entry-level. Will support GSM and WCDMA networks, and will be equipped with Bluetooth and Wifi. New information will not be long in coming, then, stay connected. For the documents issued by the FCC, however, click here.